I became an international networker last week. I didn’t mean to. 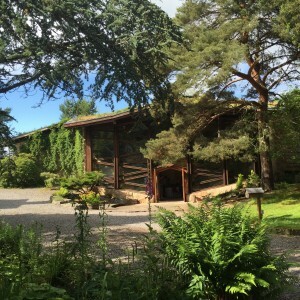 But apparently unexpected things happen at Findhorn Community, in Scotland. 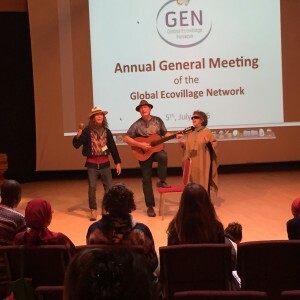 I was there for the 20th anniversary summit of the Global Ecovillage Network (GEN), and it was the first event I’ve attended with my new title of Executive Director of the Fellowship for Intentional Community (FIC). I’d heard about GEN, and its regional counterpart, the Ecovillage Network of the Americas (ENA) soon after moving to Twin Oaks in 1999. GENs gestation began around 1991, when the newly formed Gaia Trust funded a study called the Ecovillages and Sustainable Communities Report. 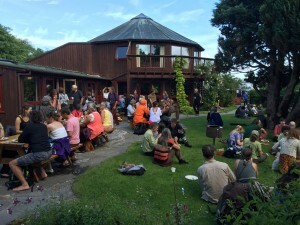 A seminal event, also at Findhorn, was held in 1995, 20 years ago. Apparently the creation of GEN, while in discussion, wasn’t even on the agenda for that event, but arose as a clear desire of those who attended. From the beginning the purpose of GEN has been to network and facilitate support for communities and the individuals working to develop them. Twin Oaks Community has been an important node in the network of communities for a long time, and this network is a global network. Most Twin Oakers don’t realize this. But pretty much everyone I met from Europe, Latin America, or Australia/New Zealand, and some from other parts of the world, had heard of Twin Oaks. While Twin Oaks has never identified as an ecovillage it certainly could. There’s no strict definition for ecovillages, and the definitions that exist act more like a vision of where we’d like to get to, as well as qualities to embody. Ecologically, Twin Oaks almost certainly has a smaller footprint than many self-identified ecovillages, at least in the developed world. And while many ecovillages may espouse sustainability, they’re not necessarily actively working towards it any more than Twin Oaks. But I’ve always appreciated how unpretentious Twin Oaks is. We’re not going to call ourselves something unless we’re willing to back it up. Also at play here is that the term intentional community already filled a certain niche in the US before the term ecovillage came along, whereas the term ecovillage filled a gap in other parts of the world. 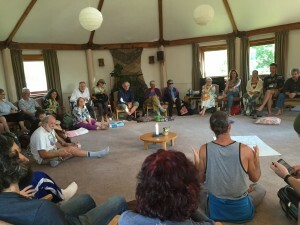 So, to some degree is just semantics, and Twin Oaks is seen as an ecovillage in the international network, and is certainly part of this global family. A feeling of family on a global level was one of the most powerful things I got out of the summit. There were people from communities from dozens of countries on every continent, and it was amazing to experience the cultural affinity between people from such a diversity of cultures. These are people working so hard from a deep reverence for the earth, a deep compassion and love for humanity, seeking balance. The passion and caring I heard in everyone’s voices and in their stories was awe inspiring. This is what they’re dedicating their lives to. It was humbling and an honor to have a place amongst these people. There were some particularly poignant stories. A woman from China talked about how their ecovillage had been destroyed by the government three times. Apparently one time they were told that the reason for the displacement was that their ecovillage was too advanced for China. At this point they’ve figured out that if they only have a few people actually living together and present it as eco-tourism they can get away with it. There was a woman from Palestine, who lives part time in Tamera, an ecovillage in Portugal. She’s working on developing an ecovillage network in the Middle East, which is made difficult in part because, as a Palestinian, she has an Israeli passport, and the only countries in the region she is able to travel to are Lebanon and Egypt. She’d also like to support connections between arabic-speaking and Israeli ecovillages, but she said that in some places in Palestine she could be shot as a collaborator if she works with Israelis. There were several people from Africa. It sounded like their governments are more friendly and embracing of the ecovillage concept, but again, it gets mixed up with eco-tourism, and the governments tend to want to exert some control. Also, the telecommunications infrastructure I so take for granted is so much further behind. They talked about trying to have meetings using Facebook messaging, and it sometimes taking hours for a message to get through to someone in another country. 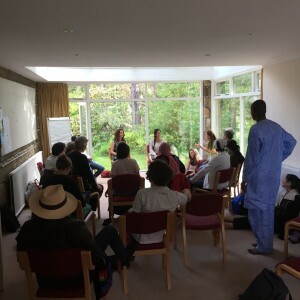 It was interesting to hear how in developing countries, the development of ecovillages is as often about transitioning traditional villages and creating new ones. The Sarvodaya network in Sri Lanka, a GEN member, includes thousands of villages working to become sustainable. It’s important to understand what GEN means by sustainability. It’s a multidimensional concept covering ecological, economic, social, and spiritual aspects of human life and habitat. At this point GEN embraces a wide range of different kinds of projects working towards sustainability, which is in part because the regions, most recently CASA, are embracing a broader range. This is something that has always been true for the FIC, and was a point of discussion in the last couple years in the conversations about the FIC participating in GEN activities. Like Twin Oaks, the FIC is also well known in GEN. GEN is made up of regional networks, Europe, Africa, Asia/Oceania, North America, and South America, with work being done to form a network in the Middle East. Those networks are often made up of national networks, and the FIC is one of the few national networks to pre-date GEN. ENA was one of the first GEN networks to form, and a number of the people who helped form ENA were also involved with the FIC. In turn, some of the key people in ENA were key in the development of GEN in the first decade. A funny thing is that this summit is where I first met a couple of the key people involved with GEN in North America. Jeff Clearwater has been involved with this stuff for a long time, and was active in the FIC quite a while ago, and is a name I’ve heard for over a decade. He turns out to be a really great guy, with a new initiative called Village Labs. 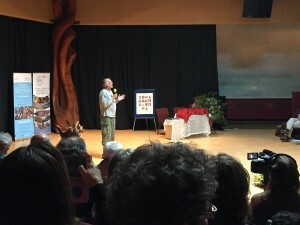 Russ Purvis is one of the main organizers of the Ecovillage Network of Canada (ENC), and has been virtually engaging in discussions between the FIC, ENA, and ENC. I’ve heard his voice and read his emails, and now I know him as a real person who cares deeply and passionately about this movement. Diana Christian, a superstar in the movement, is someone I had the opportunity to met when I brought her to a Twin Oaks Communities Conference something like 12 years ago, but haven’t seen since. I also got to meet Alberto Ruiz, who has been an important figure in the movement from Mexico, and who the FIC just awarded it’s Kozeny Communitarian Award. He came with great credentials and recommendations, and as a Board member I took it on faith that he was the right person to give the award to. Now that I’ve met him, it’s abundantly clear that he was the right person, and gives us an opportunity to redevelop ties with our Mexican family. ENA has been through quite a transformation over the years, and this summit appears to be an important turning point. 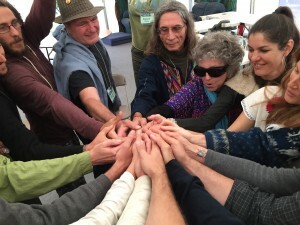 Albert Bates, from the Farm Community, where he created the Ecovillage Training Center, and has been involved in all manner of networking and organizing, was one of the main emissaries from the formation of GEN to catalyze ENA. From the beginning it was clear to him and the people he pulled in that it needed to not be a white man’s network, based and most active in the US, with Latin America a supporting character. 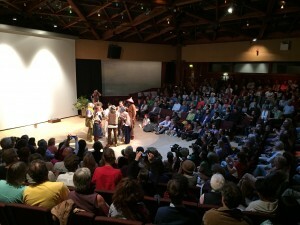 One of the first gatherings of ENA, while held in the US, included delegates from 19 countries. Over the years, much of the regional organizing was focused on Latin America. Another factor in the evolution of ENA was that the FIC was already on the scene doing regional networking in the US, and to some extent Canada, with important but minimal connections in Mexico. As the network in Latin America developed it became clear that as a culturally and linguistically distinct region from the US and Canada it needed it’s organization. In 2012 they split off and formed CASA, with Mexico joining them. Around the same time ENC formally left ENA, due to some conflicts and disputes. The GEN Constitution actually mandates that a global region of GEN must consist of at least 3 countries, and a special exception was written in to allow the US and Canada to constitute a region. A couple years ago now, the FIC was invited into discussions with ENA and ENC in the reformation of the North American network. While what was left of ENA had been very active on the International stage, they hadn’t been doing much in the US, and were interested in shifting that. The ENC was also keen to partner with the FIC, to build the network in Canada and between Canada and the US. At some point it became clear that lingering tensions between ENA and ENC were hampering forward motion, and the FIC pushed for mediation, which it offered to facilitate, before considering further collaboration. This process largely took place before the summit over video and phone calls, and, in effect, continued during it. It was clearly useful to have people in the same place, talking face to face, and, again, it is ironic that we had to come across an ocean to make this happen. At this point, the conflicts, while perhaps not fully resolved, seem to be resolved enough, and allowed for some key shifts to occur. One, ENA is going to rename itself GEN-US. Questions were still raised as to the point of continuing it as a distinct entity from the FIC, as opposed to a merger, but we’re taking it one step at a time. And now there is a serious proposal on the table to create a new GEN North America (GENNA) council, consisting of reps from GEN-US, ENC, the FIC, NextGEN North America, and possibly also CASA Mexico. These important shifts all come at a pivotal moment for GEN as well. Just a couple weeks before the summit, Gaia Trust made an earthshaking offer to GEN. It proposed to almost triple its funding of GEN over the next 3 to 5 years, to support GEN creating a new strategic plan and business model, to both further the development and professionalism of the organization, as well as to move towards greater financial sustainability. GEN has been lucky to have a major funder for all these years, but it’s also meant that it hasn’t worked on developing diverse income streams and the ability to endure should Gaia Trust support decrease or evaporate. It’s a tricky proposal to increase this support in the service of helping GEN decrease its need for it. But in particular, this increase means that GEN will be able to adequately pay key staff people, which has been a barrier to developing the self-sufficiency of the organization. This is the right time for this to happen. GEN and it’s regions, particularly in Europe and Africa, have had success in interfacing with a broad range of government agencies as well as NGOs, and are being consulted more and more often as leaders in transition strategies to sustainability. Strategic partnerships are on the rise, particularly with Gaia Education, another project funded by the Gaia Trust. Media attention is increasing (for example, in the last 10 months Twin Oaks has been visited by Al Jazeera America, CNN online, Yahoo! News, and, next week, by ABC Nightline news). A clear shift has happened in the public consciousness: an increased recognition and acceptance of the problems facing humanity followed by a desire to look for positive solutions. One of the keynoters at the summit was Ross Jackson, who founded Gaia Trust with his wife Hildur. He talked about the importance of long range planning, and offered a quote about anything worth doing needing at least 40 years to come to fruition. We’re 20 years in, and we’ve built so much. It’s exciting to imagine what the next 20 will bring. I’m so happy to read about this rich experience you had! It sounds like GEN’s Summit is something The Transition Team should make a point to attend in the future. We ARE all family, and I am glad that global events such as this exist to help facilitate and reignite that mindset. Reading about some of these struggles your fellow attendees have to deal with reminds me a lot of the issues I hear on a daily basis from The Transition supporters. That’s why we work to listen to their concerns so we can develop solutions for them. I really feel that even though many supporters have slow internet connections or limited access the website we are developing will meet a lot of the needs they have been asking to be met (for decades) once we launch officially and are out of beta testing. I look forward on speaking with you about the biggest hurdles you feel need to be addressed and how we can make them more attainable together. What a nice reading! I was wondering the relations between ENC, ENA and FIC. It pretty much sorted it out. We are living in a 30 years old ecovillage in Canada and starting to work with GEN. Let’s go GENNA!!! Reading this news is certainly encouraging . I had just joined recently, and now see why there has’nt seemed to be much activity locally. I wasn’t aware of the complexity of associations’ socialization process!…but not really surprised. It’s what we all need to finesse at whatever level of communal articulation. Looking fwd. to more contact/dialog/details.